The more I have been falling into my inner silence, the less I feel like reading. Over the last 2-3 years, I have given away books, or just put them in boxes and stowed them away where I couldn’t see them. I was just plain tired of taking in information. Yet there are some books that came my way, and helped me empty, rather than add to the knowledge I had been trying to get rid off. There is an urge in me nowadays to go into a blank state of mind, an innocence, depicted as a “Fool” in tarot. These books have been taking me there. He has nothing to lose. Free from desire, you realise the mystery. It has been a full circle for me with this book. In the very first 2 years that inner work started taking precedence in my life, I came across the four agreements. 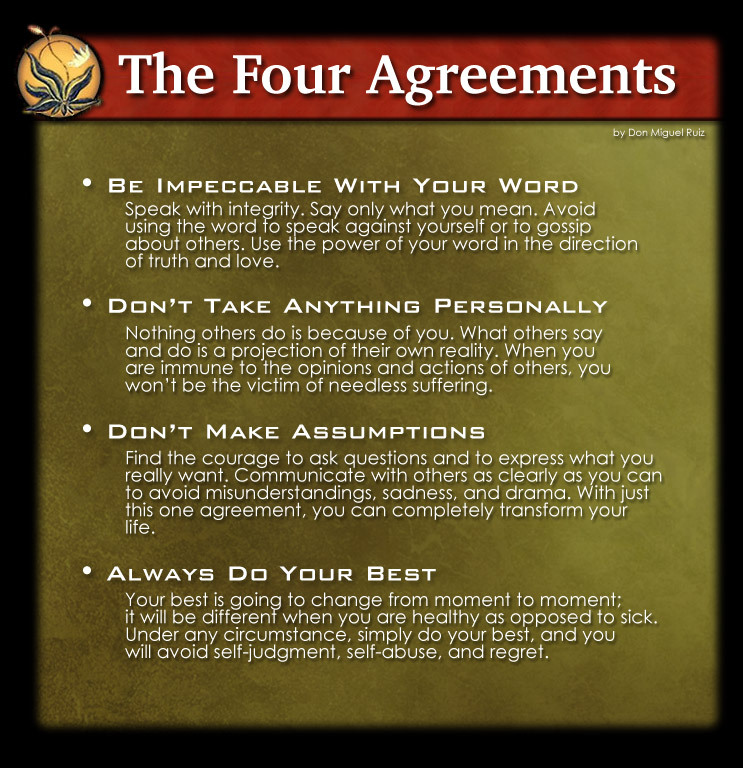 At once something in me picked it up and I found myself religiously following these agreements. They helped me bridge the gap between intellectual spirituality to actual practicing through moment to moment thinking and action. And then I forgot about them. Over the last 6 months, I revived this book from somewhere in my memory, got the audio version and made listening to it a habit. Even when I “forget” about practicing all the four agreements, there is always one particular agreement that I keep reminding myself about, which shifts me in the moment itself. It has largely helped my ego loosen its grip over me. It has helped me to understand and let go easily. The agreement is – Don’t take anything personally. A strange thing happened to me in 2008. After a lot of drama unfolded in my life related to inner child healing, I kept being tossed around violently by my own emotional intensity. At that time I was relying wholly on instinct to pick up a book and read it. One such book that came my way was Eckhart’s Stillness Speaks. Since I had also begun meditating for 6-7 hours on a daily basis, I literally resonated with the lines in that book. One day, while reading the paragraph on finding stillness in the tree, a bird in front of you, the world seemed to stand still as I was staring at the peepal tree outside my bedroom window, and every leaf was pulsing with aliveness, with eternity. When I looked back into the book, the space between the printed lines on the page seemed to carry a momentous volume of energy, perhaps as much as the energy behind the words itself. Over the next few days as I absorbed the book and the energy behind it, more than reading, I felt myself dissolving in an effortless dancing silence. Years later I understood that this is referred to as the ‘satori’ state. This state of presence lasted for months where I could watch my mind react, rather than be the reaction. I could watch the emotional turmoil rather than be the turmoil. This state gradually faded away over the year. Last year, my spiritual partner gifted me the audio book Power of Now by Eckhart, narrated in his own voice. Together we would put on Eckhart for hours and keep listening to him. Over the last one week, I felt a deep sense of emptiness overcome me. 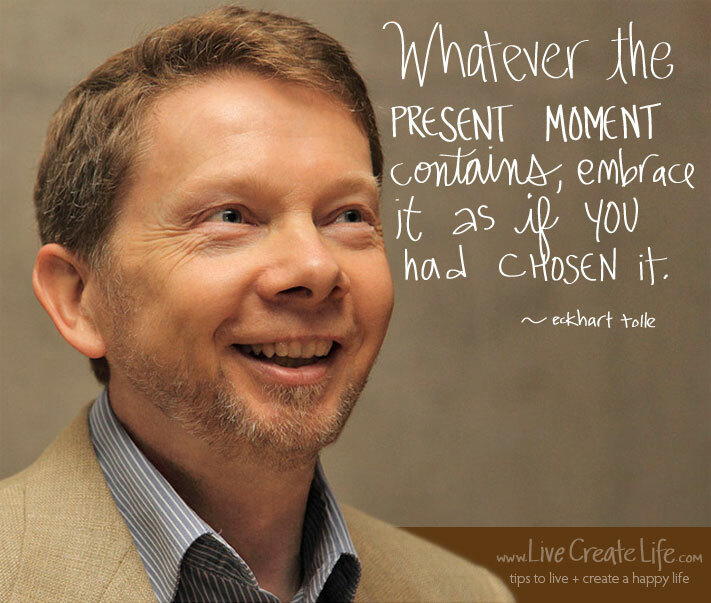 While normally it would disorient me, this time I naturally gravitated to switching on Eckhart and listening to him. I felt myself enter a very restful state of awareness. This state has led to very subtle and “soft” insights, almost like a “luminessence” of thought. Inspite of intense bouts of fear it was easy to go through the fear and enter the awareness that lay beyond. The best feeling however was the sense of immense light being present all around me. This awareness, or knowing, has been present with me ever since. As my friend from Auroville once said to me, the first part of our spiritual journey is to get the understanding that we are light, we are love. The second part is anchoring ourselves in that as a constant state, rather than it coming and going as a stage. This book has that ability to ground you in a state of omnipresence. There isn’t a single book I have read completely by Byron Katie. Although I have two books that I “hang out” with from time to time – Question Your Thinking and Change the World and A Thousand Names for Joy. The first one I found again in the midst of intense self-hate, shame and guilt about 7 years ago at a bookstore where I sat down and drank gladly from it. It gave me the strength to “impersonalise” my inner demons. The most memorable part of the book is where she talks about how angry she would get of the socks lying on the floor and then, after her epiphany, looking at the same socks with gratitude. In the latter, her very presence is reflected through every line. Just entering that book is entering the mind’s courtyard fragrant with cherry blossoms. If all of spiritual teaching in this world had to be summed up in one word alone, it would be acceptance. I dive into this book. Just weekly or monthly dips to remind me of the power of acceptance. At one point in spiritual awareness you realise there are only just basics that count, that really stay. The levels to which you experience these basics intensify and deepen their reach in your life. No one can be taught something like acceptance. Or surrender. Or letting go. Or even forgiveness. But listening to stories where these have been practiced helps us to soften our hold on our stories, our righteousness. Acceptance in itself is something very radical. For me this book helps me to get back on my sword’s edge and stay there. It helps me to get back up in places where I’ve beaten myself down, and accept who I am in totality. I carry this book on my tab so that sitting at an airport, in a cab, in that one moment of “knowledge seeking” luxury, I still turn to something that helps me drop something. Always wait for ur posts…..am feeling very restless for last 2 weeks…like something is not right in the flow….very weired…..very restless …. Planning to read Tara Brach….thanks for sharing. Thanks for dropping by Mrunal. 🙂 I hope you add some to your long list… Love. HI Deeti thank you for the lovely book reviews -they are all great books – i am interested in reading the first one right away!